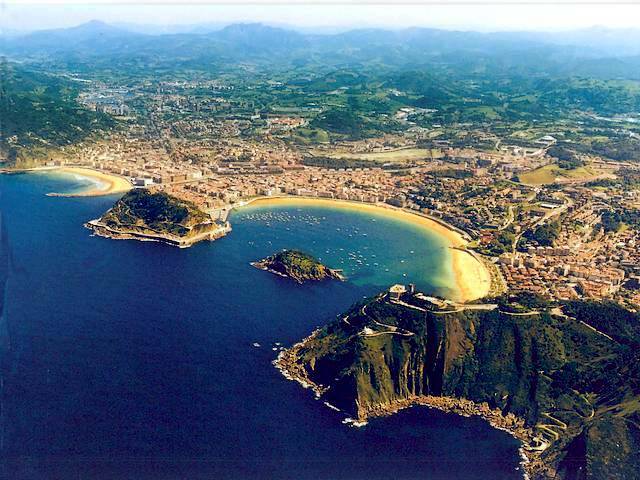 An aerial photo of San Sebastian (Donostia), a fashionable and luxurious seaside resort, which lies on the Bay of Biscay near the French frontier, on the northwest Atlantic coast of Spain in Basque country. The bay of La Concha in shape of a mussel's shell with little island as pearl in the middle, the lovely stretches with golden beaches and the two-mile-long promenade, are the pride of San Sebastian. It was a favorite spa resort of European royalty in the 19th century and nowadays, entire Spanish government has a holiday in San Sebastian in July and August.